The Starry Messenger tickets at Wyndham's Theatre, London. 2019. Find the best The Starry Messenger play tickets at Wyndham's Theatre, West End. The humdrum life of astronomy lecturer Mark Williams takes an unexpected turn following a chance encounter in his weekly class at the planetarium. 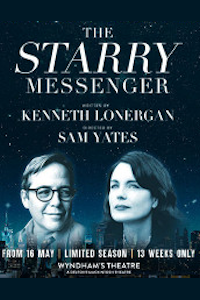 In The Starry Messenger , Kenneth Lonergan asks questions about life and death, friendship and marriage, and the Solar System in this funny and moving play. It was first performed in 2009 in New York starring Matthew Broderick. Performers Matthew Broderick, Elizabeth McGovern. Author Kenneth Lonergan. Producer Simon Friend. Producer Act Productions. Producer Gavin Kalin. Producer Howard Panter. Director Sam Yates. Design Chiara Stephenson. Costume Chiara Stephenson. Sound Alex Baranowski. Music Alex Baranowski. Director Sam Yates. Thursday, 16th May 2019 to Saturday, 10th August 2019. Open 29th May 19. The Starry Messenger tickets: The tabs above allow you to select between links to suppliers and date searching. Click on a supplier's logo to see their details and on the 'buy now' button to see and check the tickets on offer.